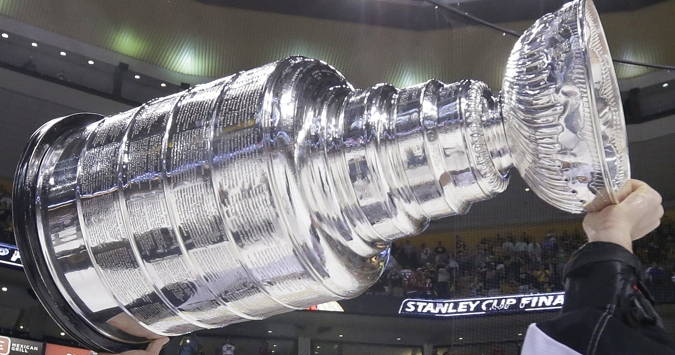 This coveted trophy, also referred to as “The Holy Grail”or simply “The Cup,” is awarded each year to the National Hockey League’s winner of the Stanley Cup Finals. It is so iconic that even the men presenting this hallowed trophy wear white gloves. The Stanley Cup is one of a kind. Unlike the other three major professional sport trophies that are made specifically for a championship team each year, this trophy is passed onto the next winner from year to year. Named after Lord Stanley of Preston, then Governor General of Canada in 1893, the Stanley Cup has been held high above the heads of hockey champions for many generations. The five bands forming the trophy’s base have special significance. Each player’s name for the winning team is inscribed on the lowest band, along with the coaches, management, and club staff. Once the band becomes full, the oldest band, located at the top of the base, is removed and placed on display in the Hockey Hall of Fame. This is an odd practice among sports trophies, as only one other professional sport in North America does this. You’ve probably seen it happen and maybe even considered it a bit over the top. 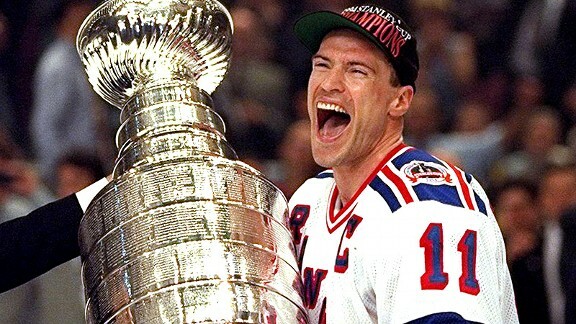 But you have to appreciate that it is one of the oldest traditions associated with the Stanley Cup. I’m talking about the winning team drinking champagne from the top bowl to celebrate their victory. This tradition dates all the way back to 1896 when the WinnepegVictorias started the custom. Now that’s a lot of champagne. The Cup is also presented to the captain of the winning team on the ice right after the series winning victory. This tradition possibly started in 1932 but it wasn’t until the 1950’s that it became an annual tradition. The presentation of the Cup to the winning captain on the ice spurred on another tradition. In 1950, Ted Lindsay of the Detroit Red Wings hoisted the Cup over his head and skated around the rink. Since that time, each member of the winning club takes a victory lap around the rink with the Cup hoisted above his head. Superstition or tradition? You have to decide this one. No player will touch the Cup until his team has rightfully won it. What’s more, some players will neither touch nor hoist the conference trophies when they win these series. They hold the Stanley Cup in such high esteem that only it should be hoisted above their heads. Not every story associated with the Stanley Cup is the sort for the history books. Being associated with a sport like hockey has its downsides also. They say boys will be boys, but really? In 1905 a player for the Ottawa Senators attempted to drop kick the Cup over a canal. He failed, but fortunately the canal was frozen over, although no one bothered to go retrieve it until the following day. In 1962 the Toronto Maple Leafs celebrated their victory around a bonfire. The Cup was dropped in and badly damaged. The club had to pay for the repairs. Not to be outdone, in 1987 Mark Messier of the Edmonton Oilers took the Cup with him to a club in his hometown and let fans drink out of it. Not surprisingly, the Cup came out of that experience with various dings in several places. It gets even better, for the Cup was taken to a local automotive shop for repairs and thensent back to the Hockey Hall of Fame. Anna McCarthy is an avid sports fan and human resource specialist. She writes on topics ranging from sports stories to business relationships for Able Trophies, a supplier of glass awardsand crystal awards.